“I adopted Shrum about 9 years ago when they estimate he was 5 years old. A Katrina rescue, he didn’t have one medical issue for almost 8 years aside from being overweight (I adopted him at 22 lbs and with good diet and exercise got him down to 12-14 lbs). In late November, Shrum got an FCE in his spine, which was not properly diagnosed for a month. During that 30 day period, he received drugs that made him so ill that he lost a tremendous amount of weight (4 lbs). The FCE in November resolved within hours and he was no longer paralyzed. In December, he got another FCE, which did not resolve. I finally brought him to an incredible neurologist (Dr. Lauren Talarico), who diagnosed the FCE, ruled out the other diseases and we started him on physical therapy and acupuncture immediately. This is when we met Carol. His weight dropped to 7 lbs in late December and we put in a feeding tube. He’s now at 9 lbs and we don’t use the tube at all for food, just a few meds. He actually has started eating like his old piggie self. Carol always made time for my usually panicked questions and was so upbeat when he’d growl in response to his new exercises. Every week there was progress, no matter how small. 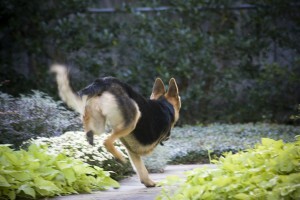 “Here’s Spirit on her first agility runs back after therapy. “Hi! My name is Koal (also known as K9 Koal). 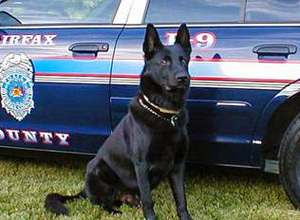 I’m a working German Shepherd Police Service Dog and work for Fairfax County. I’m trained for Patrol duties and crossed trained to locate narcotics. In December 2001, I injured my right knee and tore my ACL. I then had surgery January 30th, 2002 right before my 4th birthday, and thought my days of locating criminals and protecting the citizens of Fairfax County were over. Right after surgery, my handler (Of. Arango) was told about this really nice lady (Carol Wasmucky with Pet Rehab), who gives physical therapy to animals to help them get stronger and better quicker. He then called Pet Rehab and talked to Carol about what had happened to me. A couple weeks after surgery, while I was recuperating at home, Carol came over to meet me. Even though I felt pretty sore still, I had no problem meeting her (especially since she brought treats). Well, Carol came over several times a week to give me physical therapy and also showed my handler different exercises and things to do to help me recover quicker and make me strong again. She then told my handler about hydrotherapy, so he started taking me. 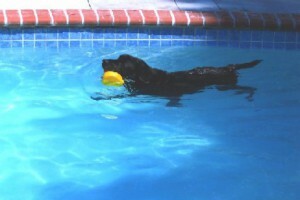 Wow-that was my favorite thing to do because I really love to swim. It worked! I got better and stronger every week. After about 3 months, I was back to work doing all the things I did before, especially catching bad guys and keeping the citizens of Fairfax County safe. 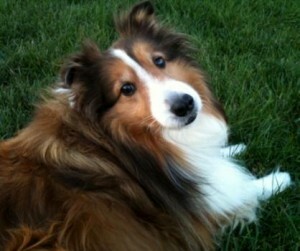 “Carol and Tanya – you both were wonderful resources during my dog’s recovery. 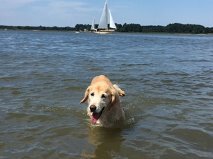 Carol – we spoke in late March/early April about my Golden Retriever, Charlie, who had a stroke. You suggested the Help ‘Em Up Harness, which was a lifesaver. Tanya – we met last weekend when we came to SouthPaws for a repeat visit. You kindly helped us with the fit of the harness.